Christopher Columbus was born in Genoa (current day Italy) in 1451. His father was a middle class wool-weaver. From a young age, Christopher was well-educated and spoke many languages and had a great extent of knowledge on classical literature. At the age of 14, he had his first journey out to sea. In the 1470s he went on numerous trips for trade that went to the Aegean Sea, Northern Europe, and Iceland. In 1479 in Lisbon, he met his brother, Bartolomeo, a map maker. Later that year he married Filipa Moniz Perestrello and a year later they had their son, Diego. In 1485, his wife died, and Christopher and his son moved to Spain to try and obtain a grant to explore western trade routes. He believed the earth was in the shape of a sphere and could reach the Far East by setting up trade routes in Asia and sailing west. Columbus promised to bring back gold, spices, and silk from Asia, spread Christianity, and explore China. His goal was to be the admiral of the seas and governor of the discovered lands. 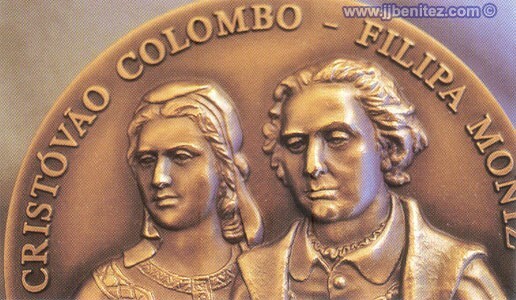 The picture shows Christopher and his wife on a coin. 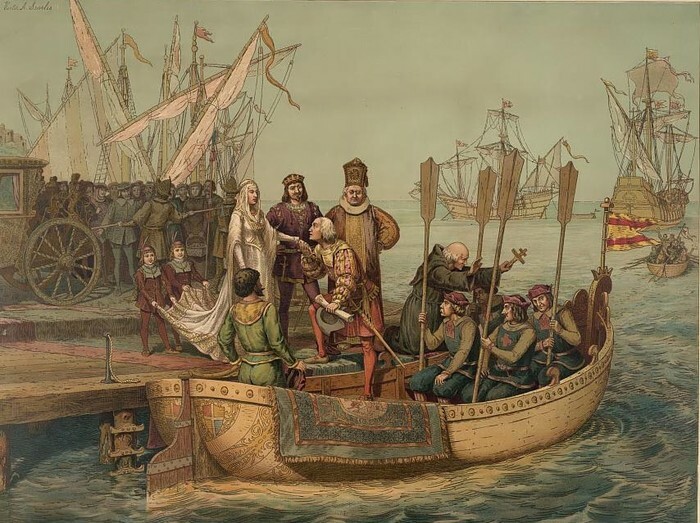 Above is a picture of Columbus and his crew on their ship, as they land in the New World in hopes to help Europe prosper. 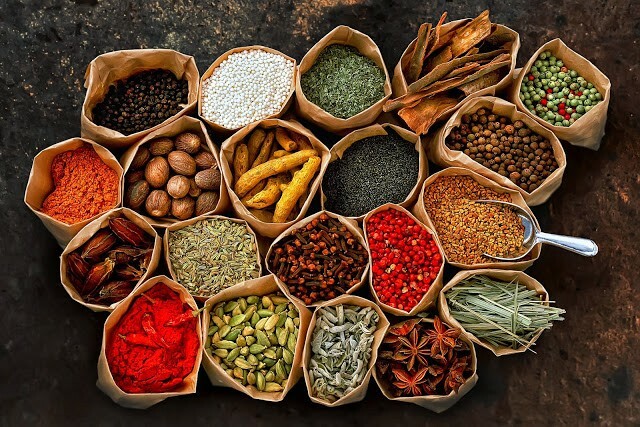 These would be an example of some of the spices the Columbus voyage wanted to find in the New World to bring back to Europe. His biggest accomplishments were the four voyages he took across the Atlantic Ocean. "These voyages led the Europeans to gain awareness of the American continents." 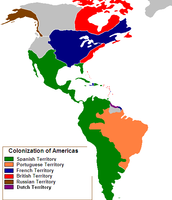 He established permanent settlements on Hispaniola which "initiated the Spanish colonization in the New World." It was originally believed that Christopher Columbus was the first European explorer to visit the Americas, however this accusation is false. Also, "his journeys marked the beginning of centuries of trans-Atlantic conquest and colonization." The map shows the Atlantic Ocean's placement in the world, to give people an idea of where Columbus's voyages passed through. 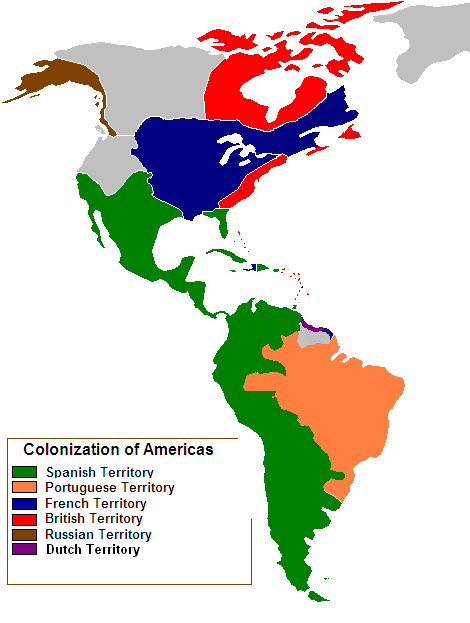 This map above shows the colonization of the Americas by different nationalities when the Columbus voyages were abroad. 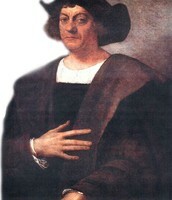 This is a portrait of Christopher Columbus. 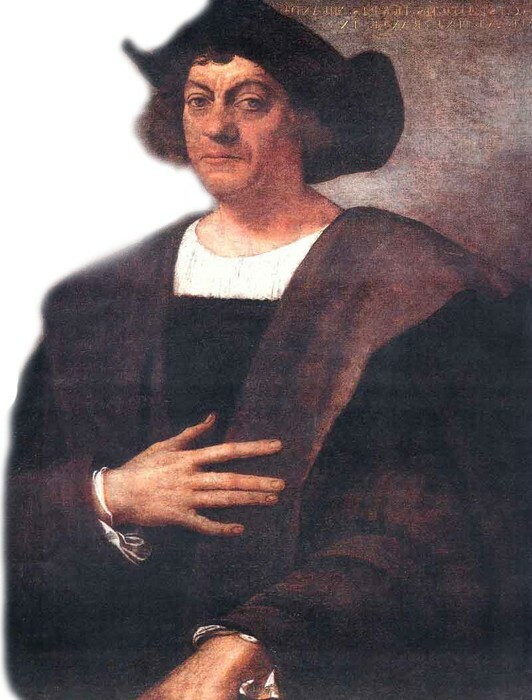 Every year on the second Monday in October, Columbus's legend is celebrated through the celebration of Columbus Day. Columbus was the first explorer to settle in the Americas, raining in a new world power and a new beginning to world history. By exploring the Americas, he also led future generations to exploration, settlement and conquest. "He is remembered as a daring and path-breaking explorer who transformed the New World, yet his actions also unleashed changes that would eventually devastate the native populations he and his fellow explorers encountered." On his first voyage the ships were no longer than the length of a tennis court and were no longer than thirty feet wide. His real name is Cristoforo Colombo. He was a very religious man. No one for sure knows where his remains (body) is. Columbus was also a good mathematician. Spanish explorer Christopher Columbus is remembered for his 1492 discovery of the 'New World,' and how his legacy of European colonization is a mixed one. Learn more at Biography.com.